What is it about Horse Illustrated magazine, with its glossy photos of gorgeous horses, that makes you feel like a horse-crazy kid again? You can just see a young version of yourself cutting out the centerfold, pinning it to your wall, and immersing yourself for hours in an imaginary tale that you, Alec Ramsey style, are the only person that is able to tame and ride that magnificent and noble beast. Well, I’ve got the flip side of that story. 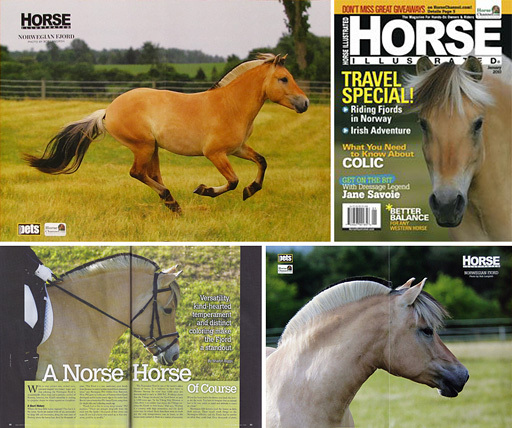 Imagine opening up Horse Illustrated and finding your very own home-bred, raised, and trained horse strutting his stuff in the magazine’s centerfold!? That’s what happened to me this month. Right now my inner horse-crazy kid is doing the happy dance! Helix is two years old in the photo, enjoying a canter in one of our big grass fields here on the farm. He is seven now, all grown up and filled out, and still lives here at Bluebird Lane. He is one of my favorite horses to ride! Helix was sired by our former stallion Felix, imported from Norway, and was the last foal out of our First Premium Dutch imported mare, Cindy. With this photo Helix joins three other Bluebird Lane horses who have been honoured to have been featured in Horse Illustrated. I know, I can hardly believe it either! Bocina was on the magazine cover in January 2010, with Bluebird Lane Kestrel as the centerfold in the same issue, and Bluebird Lane Sparrow appeared in an article spread in December 2006. The photo of me riding Sparrow at the Ontario Fjord Show was taken by Christina Handley, the other three are by Bob Langrish. I get so much joy from the beauty of our Fjord horses, and sharing it with others is just the icing on the cake. They all are so lovely. You must be very proud, Lori! Your dedication to the breed shows in the high quality of your horses at Bluebird Lane. Great work with your Fjord!! Nice to see a non-traditional warmblood winning and achieving such terrific scores! 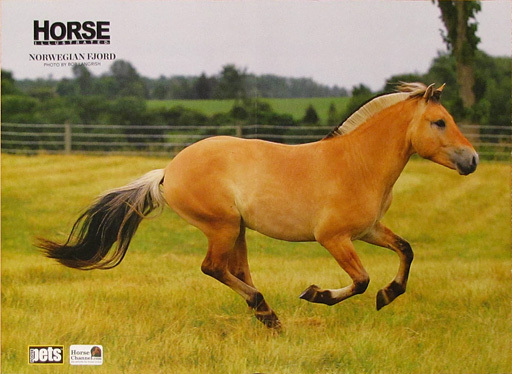 The Fjordhorse has a calm temperament, is intelligent, tractable, and very very trainable. But, born broke? Simply not true! The Fjordhorse is still a horse, and all horses need training. To let anyone tell you different is not safe and it's just not fair to the animal. At Bluebird Lane all of our horses are trained by Lori. Training begins at birth and continues with age-appropriate training for all. Our horses are handled daily, and taught to be mannerly, attentive, and responsive. Read more about our training program. Copyright © 1998–2019 by Bluebird Lane Fjords, unless otherwise noted. All rights reserved. Unauthorized duplication prohibited.